This custom-built 60ft Sportfishing Catamaran powered by twin Yanmar 440HP diesel engines out of Pez Vela Marina in Quepos will also f ish out of the Los Suenos area and Herradura Bay. Fluently bilingual Captain Roger Muñoz, with 30 years sportfishing experience in Costa Rica, is at the helm, assisted by two mates. With a 28ft beam and a 22knot cruising speed, she is fast enough to get out to where the billfish are. 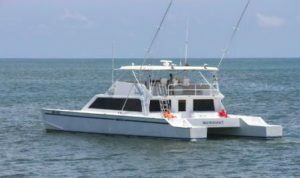 She has a covered fly-bridge, Rupp outriggers; a full range of tournament-class, state-of-the-art tackle for light and heavy sportfishing; all modern electronics, including fish finder, GPS and UHF radio, and the required safety equipment. There is a large cockpit, three a/c units, three staterooms, two bathrooms and a full kitchen. The catamaran will also do overnighters.